deep fascia of the sole of the foot; includes a thick central part, the plantar aponeurosis, covering the central compartment of the sole of the foot, and thinner medial and lateral parts covering the hallucis and digit minimi muscles (compartments), respectively. Deep fascia of the sole of the foot; includes a thick central part, the plantar aponeurosis, covering the central compartment of the sole of the foot, and thinner medial and lateral parts covering the flexor hallucis and flexor digit minimi muscles (compartments), respectively. A tough fibrous band of tissue surrounding the muscles of the sole of the foot. 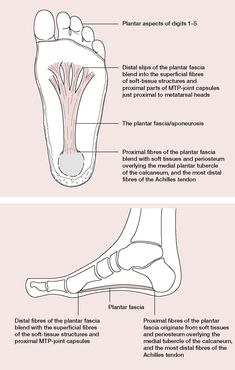 Also called plantar aponeurosis. the thick band of connective tissue on the sole of the foot, which runs from the calcaneum to the base of the toes; inflammation (plantar fasciitis) is one of the commonest causes of heel pain, usually at the attachment to the calcaneum. Pain is felt especially first thing in the morning (overnight rest with the foot in plantarflexion allows the fascia to contract) or on weight-bearing exercise: a dull pain felt along the sole of the foot. Associated with, but not caused by, a bony spur. More common in runners, gymnasts and dancers (who use repetitive maximal plantarflexion of the foot) and in those with flat feet. Management includes rest, anti-inflammatory medication, podiatry assessment, exercises to stretch the fascia, orthoses and, if severe, corticosteroid injection. These findings were supported by another study suggested that stretches of the planter fascia significantly decreased pain and improved foot function. Anderson was diagnosed with a strained planter fascia, the arch in his left foot.